Experience truly unlimited diving on lush coral reefs and precipitous walls encrusted with gorgonians and sea fans. Few spots in the world can equal the Bay Islands easily accessible and unlimited beach diving, or the attitude of resorts that are truly dedicated to offering scuba divers maximum bottom-time with minimum hassle. That's why savvy divers keep coming back for more, and Island Dreams' Ken Knezick calls Roatan and the Bay Islands, "The Best Value in the Caribbean." We have visited and dived ALL of these fine resorts. Call Island Dreams for the inside story, and experience the Best of the Bay Islands for yourself. The following prices are per person, based on double occupancy, with hotel tax included. All prices are subject to change without notice. Airfares are not included. Call Island Dreams for up to the minute pricing on discount airfares to the Bay Islands from around the U.S. In our considered opinion, CoCoView offers one of the Caribbean's best diving values. The package includes airport transfers, comfortable lodging, family-style meals, and truly unlimited diving. Please note that our prices also include the mandatory 16% hotel tax. We try to "lay it on the line," with no surprises, when you work with Island Dreams! Packages include airport transfers, lodging, hotel tax, diving, and three daily meals. Airfare to Roatan, bar bill, rental gear, other personal items are at additional expense. All prices and package inclusions are subject to change. Call for details and discount airfares. Single Supplement: Add $150/person/week in Oceanfront Room, $350 in Bungalow, $50 for a single night. Free use of ocean kayaks and non-motorized beach equipment, hot tub, exercise equipment as well as ample opportunities sight-seeing, picnicking, and day or night time excursions. Optional internet access, spa service, tours and day trips, all at additional expense. Non-Diver package includes all of the above except the scuba diving. Oceanfront Room: (9 rooms) Ocean front rooms on the beach with air conditioning and private porch or balcony. Six rooms with one Twin and one Double, three upstairs rooms with one King. King Bungalow: (2 rooms) Air conditioned, over-water octagon duplex with mini-refrigerators, French doors to private porch with hammocks. Over-Water Bungalows are booked Saturday-Saturday only. Double Bungalow: (2 rooms) Air conditioned over-water octagon duplex with min-refrigerators, two double beds, French doors to private porch with hammocks. Over-Water Bungalows are booked Saturday-Saturday only. Cabana: (12 rooms) Air conditioned over-water, French doors to private porch, one Twin and one Double bed. Night Boat Dive: Night Boat dives are $ 20.00/pp and arranged on arrival. Generally we do them on Wednesday night, weather permitting. If enough people are interested, we will send 2 boats the same night rather than 2 different nights. If we have people interested in 2 different nights & sites, something can be worked out but due to a full itinerary (BBQ's etc.) the guests will have to decide what other activities to give up. Diving with Nitrox: Nitrox is available, as well as Nitrox Certifications. Tanks are $6.00 per tank (NOT per day) or $100.00 per person for week long unlimited use (shore diving included) to CoCo View guests . Nitrox are $8.00 per tank and $125 per week for non CoCo View guests, in addition to the cost of the dives, on a space available basis only. Guests must bring their c-card. Nitrox tanks will not be released without a Nitrox/EAN c-card. 16% tax must be added to these prices. Internet Access at CoCo View: The Internet is available to CoCo View guests as long as our WDSL access is up and working. Unlimited internet access for your laptop can be purchased for $70 / week, or $50 if pre-paid with your vacation package. Fee includes 802.11b WiFi hub rental if required. Or you may purchase time in the new internet cafe at 15min: $7.50, 30min: $12.00, 1hr: $18.00. Ethernet jacks for standard RJ45 laptop connections are also available in the internet cafe. 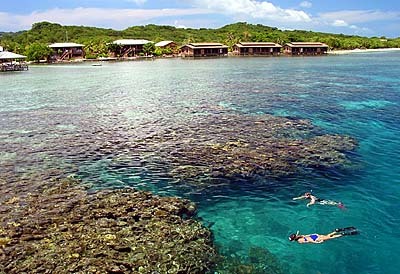 Anthony's Key Resort (AKR) is a complete diver's resort located on Roatan's north shore. There are two seasonalities - high and low - which are defined for you below. 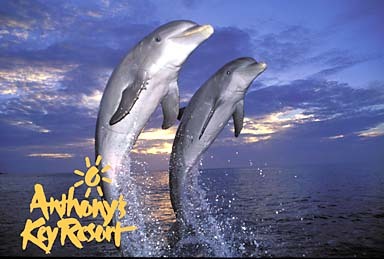 Anthony's Key is also host to Roatan's a "Dolphin Research Center." Optional snorkel and dive opportunities with the dolphins may be arranged upon arrival in Roatan, and guests of any Roatan resort may participate. Each summer, AKR is also host to an innovative "Dolphin Camp," designed for kids aged 8-14. Please contact Island Dreams for further information. Kids Camp and Families -- AKR's "Dolphin Discovery Summer Camp" for children has been raved about for years. While parents enjoy time for themselves, their children have a day full of activities, including learning about and interacting with bottlenose dolphins. New programs to the camp include SASY, Bubblemakers, and a Junior scuba certification. Kids are in 2 age divisions: 5-9 and 10-14. The program operates May 28 - August 25, 2006. Cost is $699 per child, plus 16% tax. The cost includes accommodation, meals, all camp activities and materials. Contact Island Dreams for complete details. All rates above are per person, based on double occupancy. Call for single occupancy lodging rates. Dolphin experiences are available to guests of any Roatan resort. Please note that they can only be scheduled in Roatan. Availability is limited. You are advised to book this immediately upon arrival. Your resort will be glad to assist you. Dive Package includes: 7 night accommodations/ 6 days of diving, air tanks, weight belt and weights, buoyancy control workshop, 3 single tank boat dives per day, 2 single tank night dives per week, daily dolphin show presentations, full American meal plan - 3 meals daily, welcome island cocktail and orientation, tropical picnic on Tabyana Beach, island fiesta night on the key, horseback riding and hiking, kayaks, canoeing and windsurfing, entrance into Roatan Museum, airport transfers and airline ticket reconfirmation. Snorkel Package includes: 7 Nights hotel accommodations, full American meal plan (3 meals daily), welcome cocktail and orientation, reef ecology lecture, fish ID slide show, fish and coral under water ID cards, 2 snorkel trips by boat daily w/ guide, dolphin encounter, tropical picnic on Tabyana Beach, island fiesta night in the key, horseback riding and hiking, kayaks, canoeing and windsurfing, daily dolphin show and presentation, entrance to Roatan Museum, airport transportation and airline reconfirmation. Nestled among towering trees on a hill overlooking the ocean, Inn of Last Resort offers 30 large, air-conditioned rooms with private hot-water showers and a simple but tasteful style. Easy access to dive boats, and shore diving. 7-night package includes airport transfers, welcome drink, 7 nights lodging in air-conditioned room with phone, 13.2% tax, three meals per day, three boat dives per day (16 boat dives max per week), unlimited shore diving. Hospitality: On an island famous for small resorts with great hospitality, innkeepers Andy and Donna Arcaya have carved a paradise between the mangroves, palms, and lagoons on Roatán's north shore. Expect modern conveniences like large air conditioned rooms, and a waterfront restaurant serving meals that are both delicious and healthy. Enjoy snorkeling or diving in the "mysterious garden" - a private lagoon, calm and resplendent with the delicate corals and creatures of the Caribbean. The Inn of Last Resort is a perfect base for hiking, fishing, kayaking, scuba diving, and visiting all of Roatán's attractions. Double occ. diver $748, and double non-diver $632. Triple occ. diver $667, and Quad occ. diver $574. Prices are per person, based on occupancy indicated, and subject to change. International airfare is not included. Contact Island Dreams for discount airfares to Roatan. ** The Holiday Period is defined as the period of December 10 through January 7.
and the minimum stay will be five nights. Packages include: Round-trip airport transfers, air-conditioned lodging with private bath and two ceiling fans, welcome drink, three (3) meals per day, picnic at the beach (weather permitting) three (3) boat dives per day (two dives in morning and one dive in afternoon) one (1) night dive per week (in place of the afternoon dive one day a week), unlimited day & night shore diving, tanks, weights, and belt. All pricing includes 16% hotel tax. BCD, regulator, and other equipment rentals are available at additional expense. Please note that all prices are per person, based on the occupancy indicated, and are subject to change. Fantasy Island is one of the Bay Islands' most exclusive diving and water sports resort. Air conditioned rooms are complete with mini-bar, telephones, and satellite TV. A fine, full service restaurant, brilliant white sand beach fresh water pool, boutique, and scuba center are among the offerings at Fantasy Island. Prices are person, based on the occupancy indicated. Please note that all pricing and package inclusions are subject to change. Dive Package includes: Airport/hotel transfers from Roatan Airport, seven (7) nights lodging in air-conditioned rooms, three (3) meals daily (finer dining), three (3) boat dives per day, unlimited shore tanks, one (1) night boat dive per week, and use of non-motorized water sports. When you book with Island Dreams, the 16% government hotel tax is included in the quoted price. Please note that prices are quoted per person, based on the occupancy indicated. All prices and inclusions are subject to change. Additional Expenses Include: Airfare, bar bill, souvenirs, and other items of a personal nature. 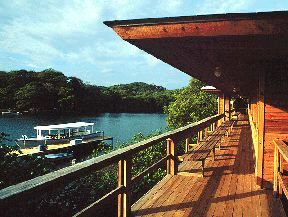 Contact Island Dreams for non-diver rates, discount airfares to Roatan, and complete details. 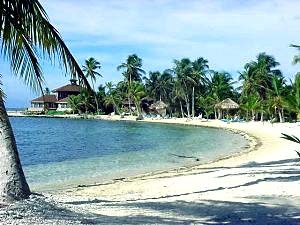 Far and away the best resort on the island of Utila, Laguna Beach Resort is an excellent all-inclusive dive option. The comprehensive package includes airport/resort transfers, all meals, air-conditioned lodging, 3 daily boat dives per day, and unlimited shore tanks. Island Dreams agents have visited this property... and we can recommend it highly. The setting is remote and natural. The lodging, diving, boats, and friendly service are a pleasure. Whale Sharks anyone? In all of the Caribbean, Utila offers one of the very best chances of seeing a Whale Shark. Swimming with these gentle giants is an experience unparalled in the diving world. And relax new divers, it's alright... because Whale Sharks don't bite! Easy air transfer available from Roatan, San Pedro Sula, or La Ceiba. Please contact Island Dreams for airfares and complete details. Find more information here: Laguna Beach Resort. Call for applicable airfares. Many discount fares available. Airlines used are not responsible for any act, omission, or event during the time the passengers are not on board their planes or conveyances. The passenger contract by the airlines concerned, when issued, shall constitute the sole contract between the airlines and the purchaser of the tours and/or passenger.